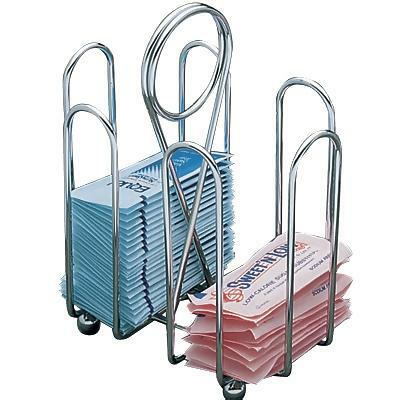 If I walk into any restaurant, deli, coffee shop in the United State there will be a sugar packet caddy. My choices are pink, sunny yellow, pale blue, (saccharin, sucralose and aspartame). Sometimes one has to ask to get the classic white packet. New to the caddy is happy green. I was startled to find out the Americans consume 16 pounds per person of zero-calorie sweeteners . The choice to use them is an attempt to quench the insatiable American sweet tooth without the calories. Unfortunately there is no evidence that people who consume non-calorie sweeteners lose weight. In some instances, they gain it. The new kid in the caddy comes with an interesting history and another load of false promises. 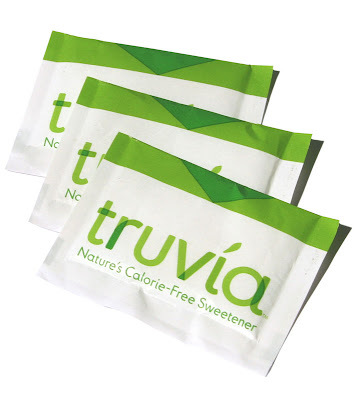 Truvia or Purevia are trade names for the new zero calorie sweetener. Once again we are being led to believe that THIS ONE is somehow different, more natural. Stevia is an herb native to Paraguay. The annual plant grows 1-2 feet tall with pale green leaves. The leaves can be gathered and dried then ground to a fine powder or steeped in water to make a liquid. The chemical substance in the stevia plant responsible for the sweetness is rebiana. It is said to be 300X sweeter than sugar – one teaspoon of stevia equals the sweetness of one cup sugar. Plus stevia is low in calories – 1/10 of a calorie per leaf. Our own Center for Science in the Public Interest seemed nonplussed about the sweetener. They cited the Scientific Committee on Food for the European Commission which concluded that “there are no satisfactory data to support the safe use of these products [stevia plants and leaves].” CSPI’s round-up on stevia also cited pro-stevia articles to be fair. That’s good because other experts felt stevia’s use was perfectly safe, a suitable sweetener for diabetics. Because the FDA would not give stevia the rubber stamp as a food, it stayed out of mainstream food products and was only sold as a “supplement”. The plant came to the forefront in 2008 when Cargill and the Coca Cola company teamed up to patent a new no-calorie sweetener using rebiana. The problem is that this new “natural” sweetener is it not a made by a simple grind or steep of stevia leaves. Though trade secrets are highly guarded, we do know that Truvia combines rebiana with erythritol, a sugar alcohol. Though there may be a lack of long-term studies supporting human consumption of rebiana, there are plenty condemning ingestion of erythritol. In studies (true, done with rats) there is an increased elimination of protein in the urine and in some cases kidney calcification. Read more here from the Quality Systems, GMP, Regulatory site. The caddies full of pastel packets seem so friendly, so normal, so reliable. Just some innocent granules to sweeten the coffee or tea. Every few years a new color is added as evidence mounts up against the pink, blue or yellow. I say stick with the sweeteners where we have lots of history and research about the detrimental affects. I shake and tear the classic white, light brown or add dab of honey. Calories be damned. What do you stir into your ice tea? Thank you so much for this article. I really appreciate that you know about the actual plant and where it comes from. So often we don’t even know that much about the foods we eat everyday! I have found that for myself these artificial sweeteners sometimes give me a headache so I have been doing my best to stay away! Keep the insight coming! Thank you for the information about these sweeteners. I’ve been hesistant to try them because if something seems to good to be true, it usually is. I’ll stick to my natural sweeteners and just use less of them. I have liquid stevia from sweet leaf at home that I’ve been using occasionally but now I’m going to see what else is in there with that stevia! It says “proprietary blend,” helpful…. “SweetLeaf is the only all natural stevia sweetener on the market today. Their proprietary extraction process uses nothing but the highest quality stevia leaves from all over south America, and cool purified water.” This from Steve at Wisdom Natural Brands. Thanks Steve. There don’t seem to be any health issues associated with this simple form of stevia. The patented products from Cargill and Coke are much different. Xylitol is a sugar alcohol. It is produced by hydrogenation of xylose, which converts the sugar (an aldehyde) into a primary alcohol. Some feel that it is safe to use, including Dr. Mercola. Eaten in large amounts, it can cause diarrhea. I don’t tear any of them — like my coffee unadulterated! If it has to be sweetened? I suppose it depends on the need – hot tea get honey (I carry honey sticks in my purse) iced tea gets, well. There is a sliding scale there. First choice is usually the honey, next up is if I’m lucky enough to be at a restaurant with those little pats of real fruit jelly (a spoonful of raspberry jelly in cold tea is delicious), and if all else fails – sugar. The fake stuff? Ummm. I’ll just take it black if I have to. Can’t stand the taste, can’t stand the idea, and can’t bring myself to use things I can’t spell easily and without thinking too hard about it. Thanks for sharing! Good to know the difference between actual stevia and that packet with a similar name. People have been recently asking me my thoughts on this issue and I have to say I like to stick with what I know and trust. Honey and evaporated cane juice sugar are my faves. I have a Stevia plant in my herb garden, but I never use it for anything besides chewing on occasionally. I dont actually know how to use it in cooking. I usually use sugar or honey, or maple syrup in yogurt, but I keep thinking I might try out the stevia in something.